Destin, Florida can absolutely offer a traditional beach vacation experience. There are stunning white sand beaches, hotels with inviting pools, and an abundance of seafood at local restaurants. However, what sets Destin apart is the sheer number of activities that are less traditional. If you're serious about making memories in Destin, then these four unique activities should be on your itinerary. There's something special about slides. Whatever your age, they have a way of transporting you back to childhood, and making a splash is the ultimate way to cool off on a hot Florida day. Ditch the lines at the public waterslide and enjoy your very own private slide. 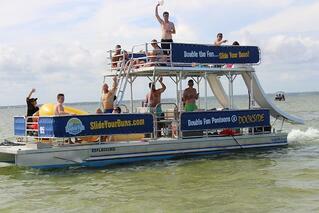 By chartering a double-decker pontoon boat in Destin, you can access your very own waterslide for the day. Right from the top deck of the boat, two water-powered slides are guaranteed to be a serious dose of fun. It’s a great activity for kids, and the big kids too! It's not a trip to the beach unless you have a bucket and a spade along. However, a basic sandcastle isn't all that you can create in Destin. The fine, white sand of the beaches in Destin are perfect for getting seriously creative, and sand sculptures are often spotted along the coast. One of the most unique experiences you can have in Destin is taking a class in building sandcastles. Keep in mind that this is not just for kids, although they will certainly love it! The folks at Beach Sand Sculptures can meet you at the beach and help you craft serious works of art, including sculptures for a wedding backdrop or for an unforgettable proposal. Destin is known for its great weather, and many of the activities travelers enjoy are outside. On a rainy afternoon or just when you need a break from the sun, an indoor adventure can be a fantastic alternative. That's exactly what you'll get with the Ultimate 7D virtual experience. You've probably heard of 3D, but 7D is an incredible upgrade that you have to experience in order to believe. With 7D, it's more than just what you can see. It also includes the added dimensions of moving seats, environmental factors like rain and wind, and even a video game element. This is a serious crowd pleaser, and it is conveniently located right at HarborWalk Village in Destin. While you don't have to worry about spotting any alligators at the beach, these reptiles are a unique part of Floridian culture. Although few of us enjoy spotting enormous alligators in the wild, seeing young alligators can be a blast. That's exactly what you can do at Gator Beach located at Fudpucker's in Destin. Fudpucker's already has a lot to offer including great food, video games, and live entertainment. To round it all out, Gator Beach lets you admire fully-grown alligators, spot a rare albino alligator and even hold a baby alligator and snap some photos. This is a unique experience that is the perfect way to round out a great day in Destin. Clearly, there are plenty of unique activities to enjoy in Destin. Don’t miss out on chartering a double-decker pontoon boat while you’re in town. With boats available for half-day or full-day charters, let Double Fun Watersports help you create some great memories on your Destin vacation.